I love sushi, especially the rolls or the maki. 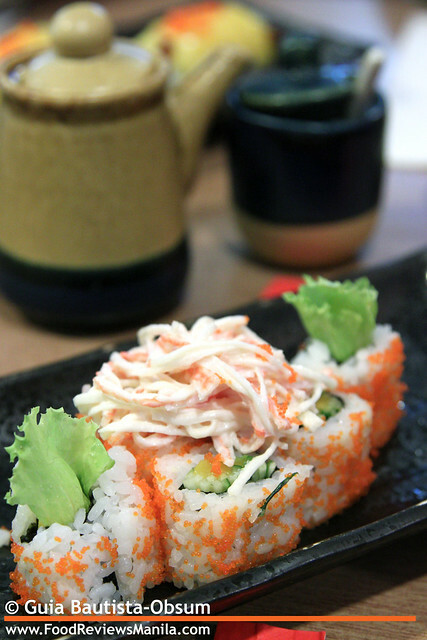 My favorite variant -- California Maki! 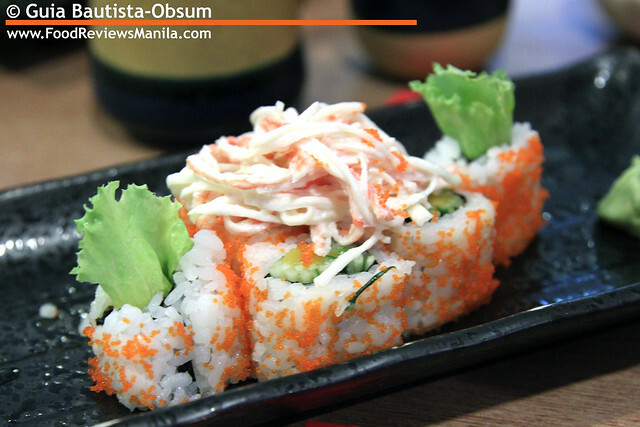 Sumo Sam was created by actor Marvin Agustin and his partners; more of an Americanized style of the Japanese cuisine. When we arrived, the restaurant was bustling with waiters going from table to table, families buzzing with chitchats, friends chuckling to stories eagerly told. We took a seat at one of tables outside the resto and started perusing the photo menu (I love picture-filled menus, it gets the appetite kicking). 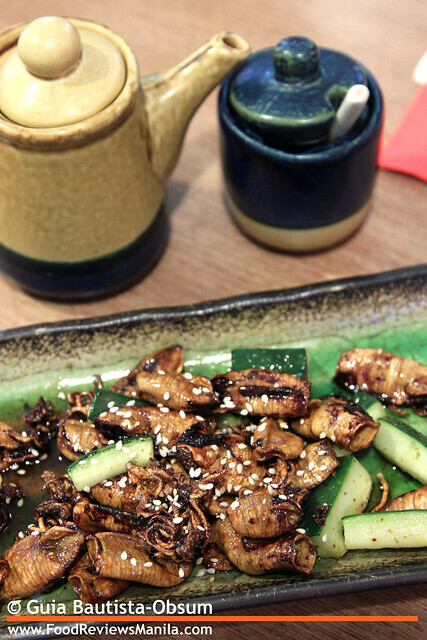 For starters, we selected the Crunchy Squid Teriyaki (P208), and what a good choice we made. Each bite of the crispy squid was thunderous; the teriyaki sauce it was bathed in a fitting saccharinity for each delectable chomp. As if the texture wasn't sufficient, a shower of sesame seeds covered the kickshaw supplying more nibble worthy character to this appetizer. Now if only the meat itself had been more tender, I would have sung praises for the Beef Enoki (P288). Instead, the tough beef proved to be quite a challenge and thus, consuming the long strands of enoki mushrooms enwrapped in rubbery meat was a feat for the jaw. That's not to mention the charred flavor that quelled the sauce's own. As I've mentioned in the blurb (as well as throughout the Japanese posts of this blog), my favorite maki is the California Roll (P218). 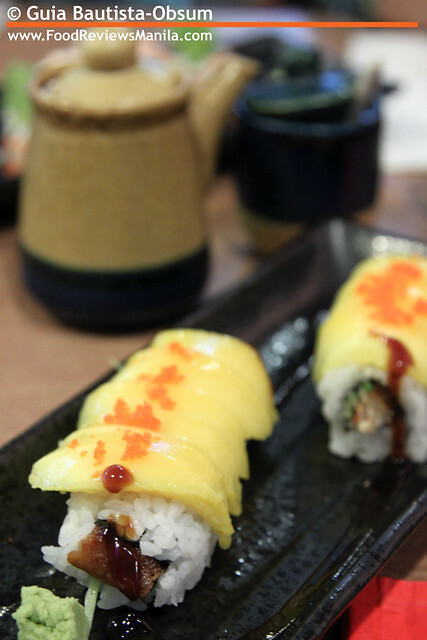 Fresh mango bits with sliced cucumbers and a bit of crab stick wrapped in sticky rice embellished with orange roe. Top all of that with a tangled heap of crab stick salad dotted with the same tiny orange roe and now you've got one tasty sushi dish that's fresh on the taste buds and heavy on the appetite. I also tried their Dragon Roll Unagi (P238) -- I told you I love sushi. Strips of unagi (eel) drenched with a sweet, brown sauce cocooned in sticky rice helmed with strips of canary-yellow fresh mangoes and a splattering of those orange roe. The mangoes, though not as sweet as I would have preferred, lent a contrast to the treacly yet still savory sauce, providing more layers of flavor to the plate. 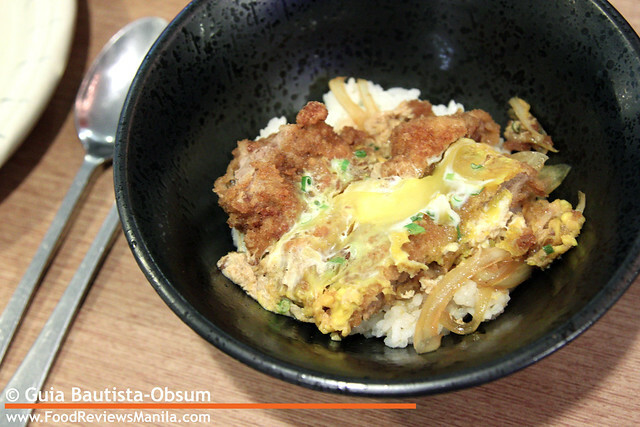 Don't be fooled by the tiny amount of Katsudon (P208) you see in the bowl. I had it split into two servings since my daughter wouldn't be able to finish one big bowl of it. The broken golden yolk in an about-to-dry-up state was slathered across thick slices of breaded pork.Chopped chives dotted the surface while caramelized onions were hidden underneath. The meat was soaked in a sweet sauce which was attractive to a kid's palate hence the reason my daughter liked it so much. 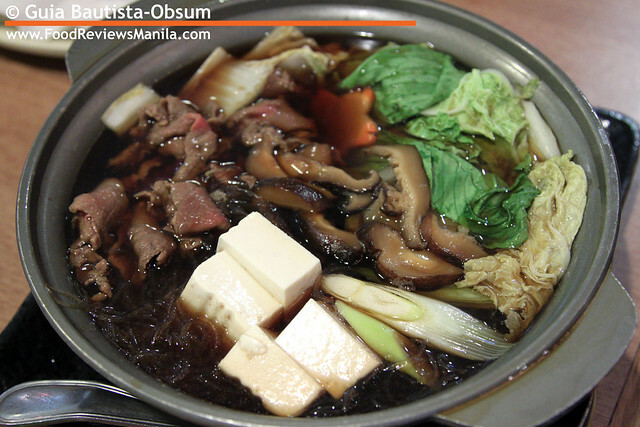 The Sukiyaki (P368) abounded with various components such as blocks of tofu, sliced shiitake mushrooms, cutlets of beef, star-shaped slices of carrots, scallions(?) and Chinese cabbage(?). I gingerly pull some vermicelli noodles and carefully transfer it into my bowl, strands escaping my utensils messily. The broth was savory with a hint of sweetness -- good enough yes, albeit I still favor Red Kimono's version. 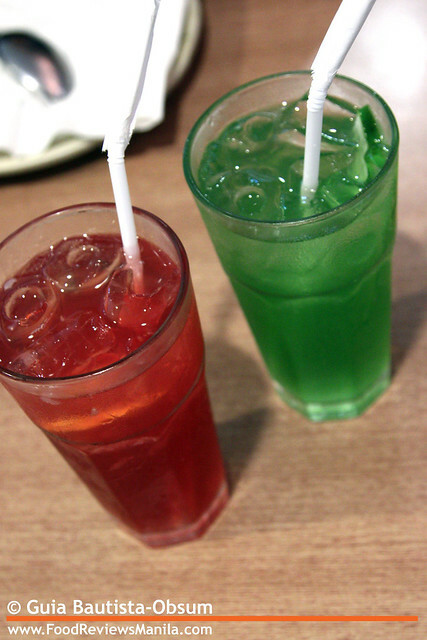 Red and Green Bottomless Iced Tea (P98) - Sweet. Very, very sweet. Enough said. Japanese food is one of my weaknesses, I would still my soul for it. everything looks good! 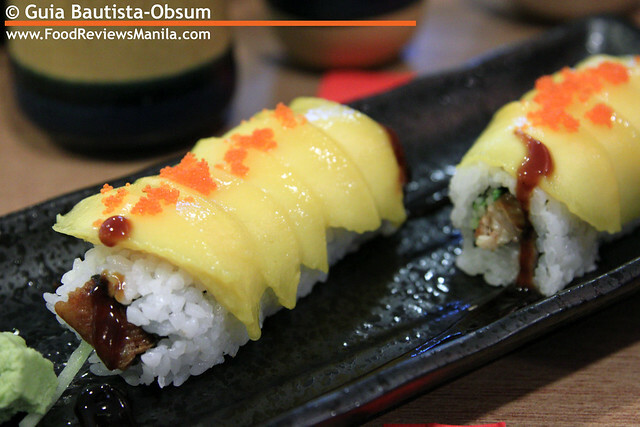 ive read so much rave about SumoSan pero hubs and i havent tried dining there yet. gotta make sure i do so this coming year. I find the food at Sumo Sam very lackluster considering its prices. 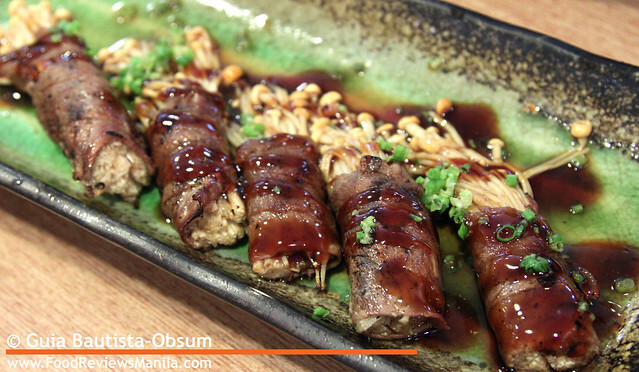 They don't hold a candle to the authentic Japanese restos, sadly most of them are in Makati. These authentic Japanese restos are even sometimes cheaper than Sumo Sam. 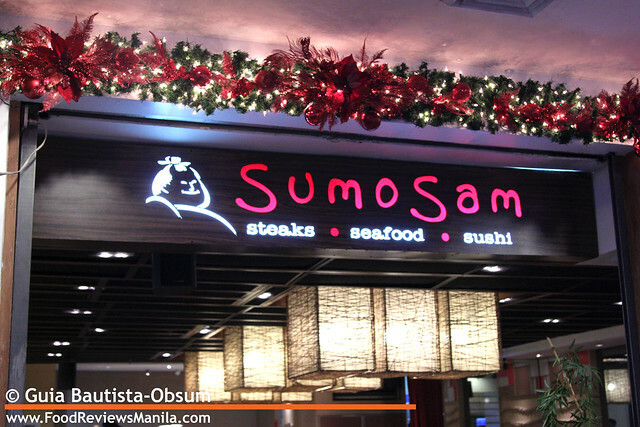 I love the foods in Sumosam especially the rolls and wagyu,I've been in several branches like in Greenbelt, but I'm quite frustrate in Shangrila plaza although the server were doin great but the manager there don't know how to talk, he seems so rude.I think he need a proper training in customer service. i just ate at sumo sam at gateway mall and the waiter could not describe the burger i wanted then after ordering it, he says all burgers are unavailable. so i settled for a teriyaki dish and a mango shake. half way through my meal, the mango shake arrives. di ba dapat the drinks come first? anyway, the ice particles are so huge i could not use a straw. i settled for a spoon to find out i could not use a spoon either kasi the ice was so big. that was the worst mango shake in my life! you try to relax for lunch but now i got so upset! nakakasira ng mood. dapat when they open a restaurant, ready and trained na yung mga workers. if they are not ready to properly serve customers, they should not open at all!